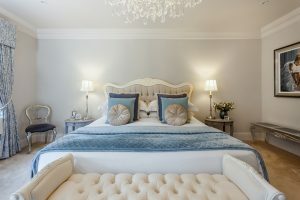 Emma Jane Betsy is an interior designer and stylist based in Ringwood, Hampshire. We have had the honour of working with Emma on one of her projects over the last few years and here we have the pleasure of showcasing this in our journal. 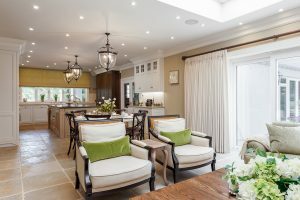 Located in Canford Cliffs, this is undoubtedly one of the best homes that Emma and ourselves have had the privilege working on. What used to be a modest simple home, now boasts one of the best interiors that we have ever seen. When you enter this home the feeling of grandeur and comfort almost takes your breath away. You feel instantly wowed by the ambiance that’s been created and you could almost be anywhere in the world with its colonial tones. Its new interior style has been totally created and orchestrated by Emma Jane. 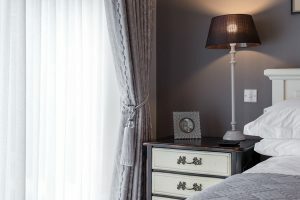 Emma Jane specified the colour palette for every room and sourced and supplied all of the furniture, lighting and accessories. This beautiful home is now complete and fully furnished, with every square inch carefully accounted for. It features an extensive amount of painted wood panelling to flow from room to room, to offer unity throughout the house. 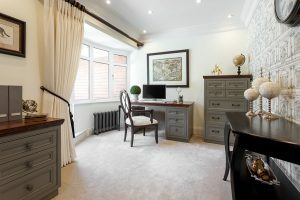 Custom in-built wooden furniture, all painted to Emma’s’ specification from the mood boards supplied. The storage available in this home is plentiful which means it remains uncluttered and beautifully presented at all times. The style of this home is very much of Emma’s signature traditional English country and colonial theme. The floors throughout the entire ground level consist of beautiful natural stone and dark oak wood, dressed with beautiful silk woven rugs. The Lounge and first floor have been fully carpeted in a sumptuous cream, thick pile carpet. The wooden panelling continues up-stairs and further in-built cupboards are finished in luxurious colours, some with glass doors dressed with fabric behind for a traditional and timeless look. The paints throughout the house have all been chosen from the Little Greene Paint Company range. Apart from the Study and master dressing room, wallpaper has been excluded to allow for the many decadent mirrors, framed pieces of art and family photographs which adorn the walls. Emma chose each piece of furniture to complement each rooms’ individual needs. The furniture is ornate, traditional and impressive with many of the cabinets displaying more stunning accessories. Wherever you look your eyes will stumble upon something unique. 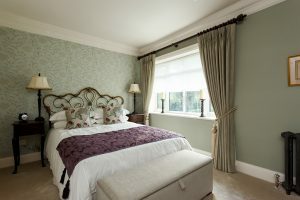 We provided all of the window dressings and soft furnishings. Working closely with Emma we were able to make to her brief and show case the stunning fabrics that she had selected. 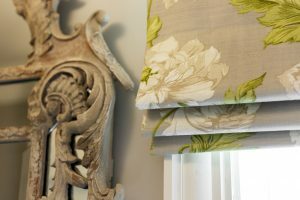 The team at Bryant Interior Furnishings supplied handmade roman blinds, upholstered furniture and pelmets, curtains and cushions. 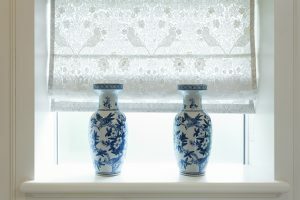 The window dressings all comprise of a first layer of sheer in the form of a roller blind, roman blind or sheer curtain and a second layer of sumptuous interlined curtains. Allowing the interiors and flooring stay protected from harmful UV rays whilst the curtains offer warmth and room darkening when needed. 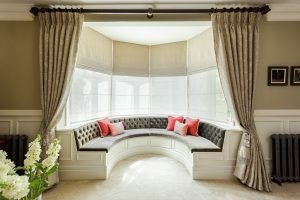 All of the curtains are hung from substantial dark oak wooden poles, and all the fabrics are from leading fabric houses such as Colefax and Fowler, Zoffany, Sanderson, William Morris, Robert Allen to name just a few. The fabrics used include classic damasks, intricate embroidered patterns, plain linens, silks and woven jacquards. The curtains are dressed into ornate tiebacks, some made from cut glass, feathers and painted wood. 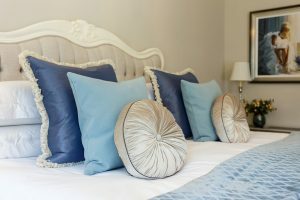 Gorgeous trimmings were added to customise and embellish the cushions for the seating areas and bedrooms.